Keri, Rob, and I headed out snowmobiling today and it was my first time. Yep, a noob. I managed to stay on the thing 98% of the time, but you can bet I did fall off. Twice. The first time, pictured left, was out of self-preservation (I thought). I was climbing a cliff and I thought the thing was going to fall back on top of me so I let go and rolled off to the right - with the grace of a moose doing ballet. I was surprised at how fast these things go. I got mine (actually Amanda's; she let me borrow it without knowing in advance) up to about 65 mph, while Keri and Rob went at least 90. Every time I started flooring the throttle, I'd hit a bump and spend the next quarter of a mile trying to get my balance back and back on course. What a blast I had. Can't wait for the next opportunity. I've already told Beth that we're getting one, a two-seater. She's nervous. Enjoy the vid! 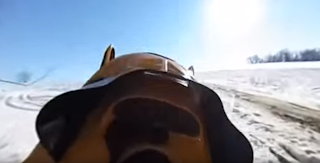 It's a 360 degree video, so you should be able to rotate the screen around for 360 views. Give it a try!